Identifying your target demographic's needs is a vital business skill: from the Costco brains who realized that parents need to buy food in huge bulk, to the Chris Farley handlers who realized the same. 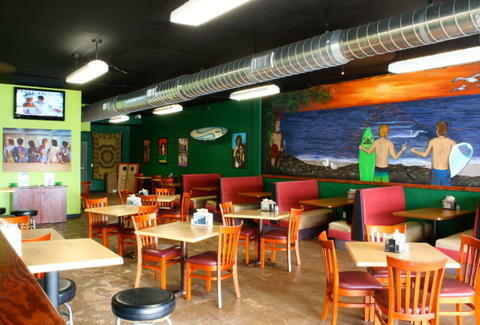 For a weed-themed eatery that's figured out what the college kids want, check out CHeBA HUT. Started in '98 by an ASU grad whose noncturnal delivery gig uncovered a depressing lack of "quality" late-night options and an encouraging proportion of clientele...heavily desirous of quality late-night options, the HUT's a late-delivering, "toasted" sando shop (their 13th national location) decorated with stoner art, music posters, and a locally commissioned wall mural depicting two toking surfers and an Aztec, who apparently couldn't keep his Apoco-lips-O off their J. Sandwich madness comes in Nugs (4"), Pinners (8"), and footlong Blunts, and includes the SD-only "secret stash" of local faves, like the hummus/pineapple/pepperjack "Maui's Finest" and the turkey/jalapeno/chipotle mayo "Kali Mist"; while standard items include veggie numbers like the "Griefo" (hemp cream cheese/pepperjack/guac/veggies), and tweaks on old-schoolers, like the Reuben-esque "Endo", so potent, post-consumption bike riding will result in tripping straight over the handle bars. Further deli-iciousness ranges from the "White Widow" (chicken breast/"home-grown" ranch/mushrooms/bacon/provolone) to the BBQ roast beef "Chronic", to the fully porked ham/salami/prosciutto/bacon/pepperoni/cheddar "Five 'O'" -- order one loudly and you'll have no trouble finding a seat. They've also got killer "munchies" like Hemp Brownies and peanut butter/cocoa/Rice Krispies "Goo Balls", and a tap pouring dry mouth-quenching Kool Aid -- one product that, like SNL when it came to hilariously fat performers, just said "Oh Yeahhh".